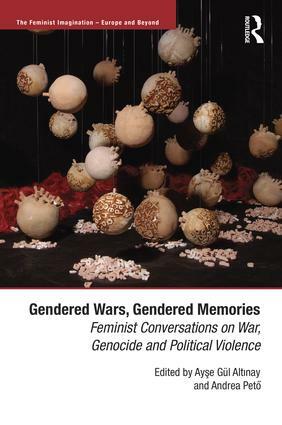 FASS Faculty Member Ayşe Gül Altınay's new book "Gendered Wars, Gendered Memories" (edited by Ayşe Gül Altınay and Andrea Petö) has been published. The twentieth century has been a century of wars, genocides and violent political conflict; a century of militarization and massive destruction. It has simultaneously been a century of feminist creativity and struggle worldwide, witnessing fundamental changes in the conceptions and everyday practices of gender and sexuality. What are some of the connections between these two seemingly disparate characteristics of the past century? And how do collective memories figure into these connections? Exploring the ways in which wars and their memories are gendered, this book contributes to the feminist search for new words and new methods in understanding the intricacies of war and memory. From the Italian and Spanish Civil Wars to military regimes in Turkey and Greece, from the Armenian genocide and the Holocaust to the wars in Abhazia, East Asia, Iraq, Afghanistan, former Yugoslavia, Israel and Palestine, the chapters in this book address a rare selection of contexts and geographies from a wide range of disciplinary perspectives. In recent years, feminist scholarship has fundamentally changed the ways in which pasts, particularly violent pasts, have been conceptualized and narrated. Discussing the participation of women in war, sexual violence in times of conflict, the use of visual and dramatic representations in memory research, and the creative challenges to research and writing posed by feminist scholarship, Gendered Wars, Gendered Memories will appeal to scholars working at the intersection of military/war, memory, and gender studies, seeking to chart this emerging territory with ’feminist curiosity’.